So I went to the Brooklyn Museum exhibit “Coney Island: Visions of an American Dreamland, 1861-2008” looking to find it again. Old photos made me wish my kid self had had more guts. The horses with real tails were there, but they looked small to me now. Mostly I found a Coney I never saw as a child: a site of the transgressive. The exhibit was a blowout of libido, grotesque freaks of nature, and fearful images bursting from the collective unconscious. 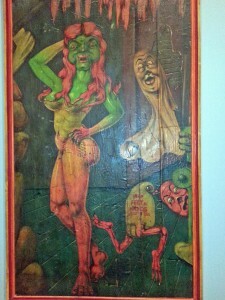 Clockwise from top left: mural advertising the “seductress” inside the Spook-a-Rama ride; the Cyclops that sat atop the Spook-a-Rama in front of a poster showing its original installation; posters for two of many freaks. All photos mine except the Cyclops, by Winkie Ma. 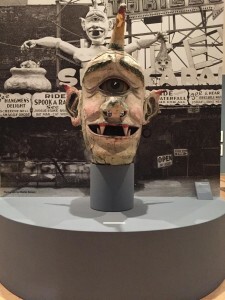 That Coney, which lasted through the first half of the 20th century, offered real freaks (deformed and disabled people who made a living displaying themselves) and imagined monsters. In clips from Coney’s long movie history, courting couples rode the roller coaster, crashed around in bumper cars (colliding delightfully into each other), and disappeared into the darkness of the Tunnel of Love, where women let their fences down, and men climbed over. 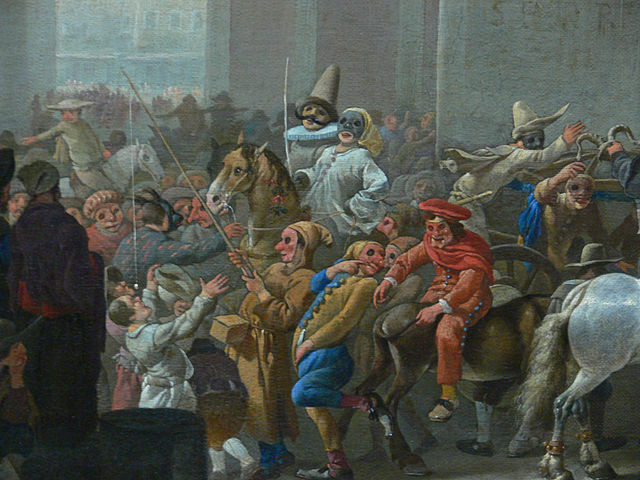 Carnival gave people a chance to let off steam, to give rein to unsocialized, anarchic impulses. So did Coney Island, as is clear from the names of two major attractions: Luna Park (ruled by the moon, a place to be a lunatic for a while) and Dreamland. Even today I regret my own timidity. 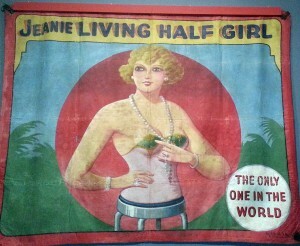 But other young girls of my time had more guts. Bonnie Anderson: I got scared on the Cyclone, but I went again and again. 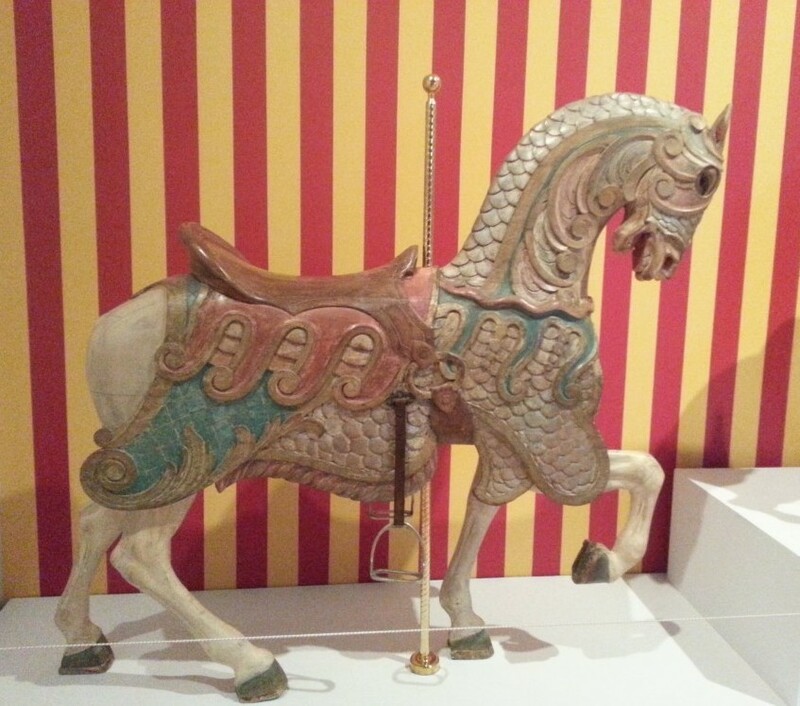 I loved one carousel—you had to be 16 to go on it. It was really fast and big. On the ferris wheel I went in the swinging cars. Arline Zatz: Once in a while, on a date at Coney Island, a boy who could spend $1.50 would treat me to a ride on the Parachute. Only the brave would opt to go on that ride—and I was brave enough. It was very scary. You’d be strapped onto a small seat (for two), with only a little piece of leather on the seat and one across the back and slowly be pulled up to the top and suddenly, the world seemed to drop out and you went down very quickly. There’d be a big bounce at the end. This was when I was between 14 and 16. It was a real thrill. Think of girls growing up in the fifties, taught to be ladies, warned to be respectable, hemmed in by restrictions. Some loved scary rides—some loved horses. I would never (then or now) go on the Cyclone, and I find the new Thunderbolt simply unimaginable. Today we don’t consider it appropriate to gawk at freaks, but the rides are still wild. Standing on the beach, you can hear the shrieks of roller coaster riders at quite a distance. As for libido, the Tunnel of Love seems pretty tame in these days of the Mermaid Parade. 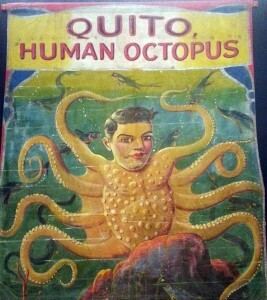 And sometimes you can even spot an old-fashioned freak. 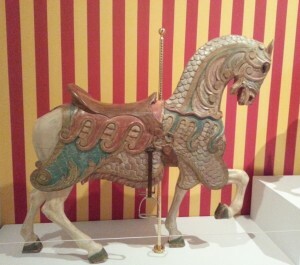 I only went once and was a sucker for the magnificent carousel horses, as well!